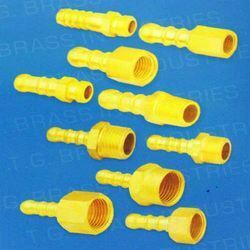 Backed by of our skilled workforce, we have been affianced in offering a flawless gamut of Brass Male Female Inlet Nozzles. Under the supervision of our adroit professionals, the offered nozzles are manufactured using supreme grade brass and highly advanced techniques. 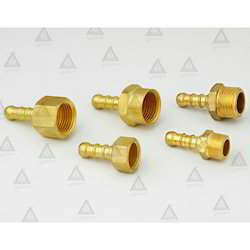 These nozzles are specially used in high pressure gas appliances for inlet connections. 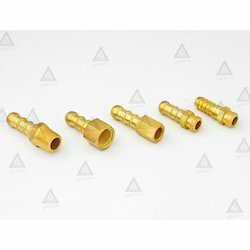 As per the specific requirements, these nozzles are offered at reasonable prices to our clients. 1/8" b. S. P. T. M.
1/4" b. S. P. T. M.
3/8" b. S. P. T. M.
1/2" b. S. P. T. M.
1/8" b. S. P. P. F.
1/4" b. S. P. P. F.
3/8" b. S. P. P. F.
1/2" b. S. P. P. F.
With enthusiasm, our versatile organization is offering the best quality array of Inlet Nozzle Male & Female. In order to manufacture this nozzle in accordance with set market, our dexterous professionals use the best quality metal and sophisticated techniques. Finding application related to controlled gas supply, this nozzle is highly cherished by clients. Besides, we offer this nozzle to the patrons several lengths as well as diameters at most competitive rates. Use : Nozzles are used for rubber hose connection.